This is a recipe I invented to build in the morning, store in the fridge, and then pull out to bake on those nights our boys have baseball practices. 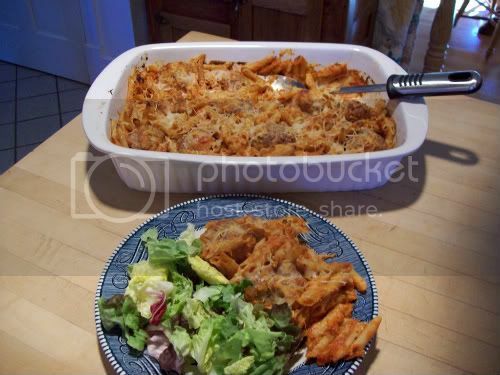 If you'd like to see how I was able to feed 4, with left overs, for $5.00 you can see my post at Money Saving Maine-iac. 2.) Begin cooking pasta according to package directions. 3.) In a medium size bowl mix turkey, bread crumbs, carrot, onion, egg, parmesan cheese, an pepper. 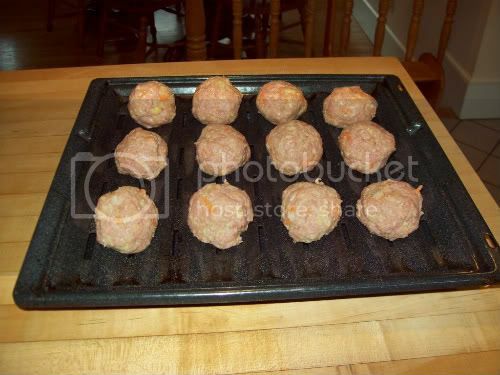 Using a 1/4 measuring cup, make 12 meatballs. 5.) I a 13 X 9 inch baking pan combine meatballs, 1/12 cups of the mozzerella cheese, the drained pasta and 1 can of pasta sauce. 6.) Sprinkle remaining 1/2 cup of mozzerella over the top. This is where I cover the dish with aluminum foil and, with a permenant marker, write baking temp. and time on top. I store it in the fridge until ready to bake. 7.) Bake at 400 degrees for 30 minutes. EVERYONE in the family loves this! It fed 4 people, 3 adults and 1 child, supper with leftovers for lunch the next day. 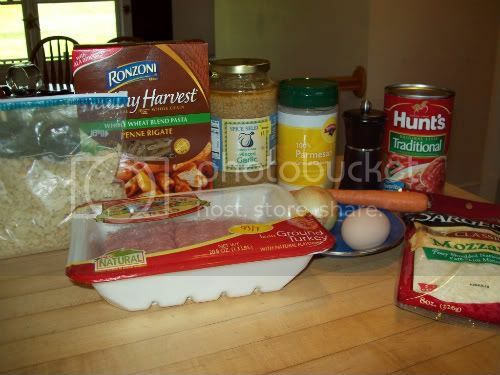 When I see ground turkey on sale BOGO this is the recipe I pair up with the sale. 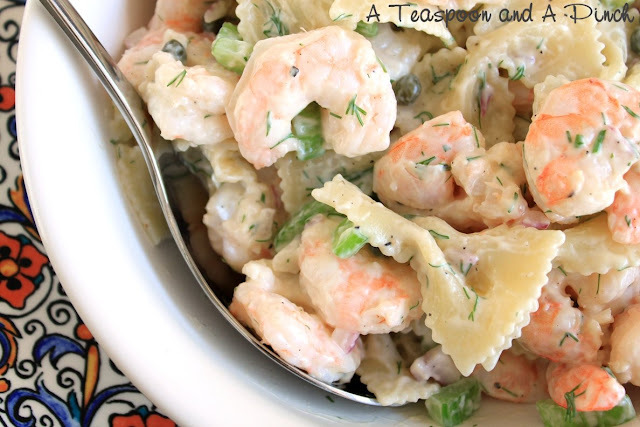 A simple salad goes well with this dinner. Our Rhubarb patch is full and ready for harvesting! 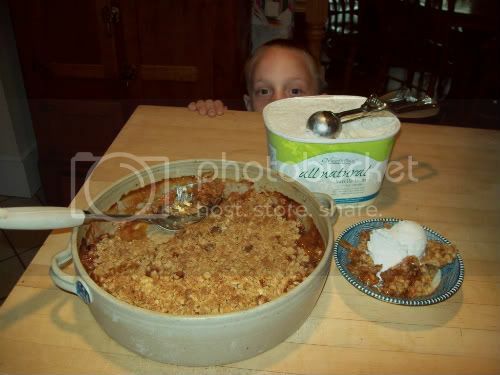 So I baked an Apple-Rhubarb Crisp for dessert. 1.) Grease and flour a 9-inch square baking dish. I use a round. 2.) Heat oven to 375°. 3.) 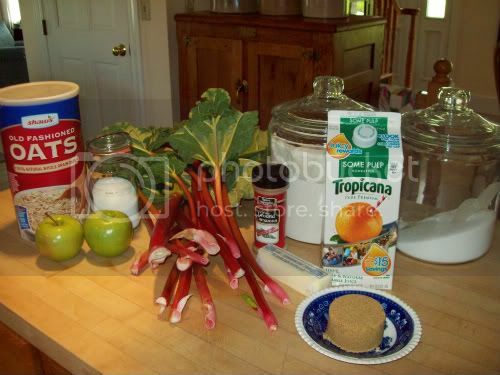 In a bowl combine rhubarb, apple, sugar, juice, cinnamon; spread in the bottom of the prepared pan and dot with the butter. 4.) In another bowl, combine remaining ingredients until blended and crumbly. 5.) 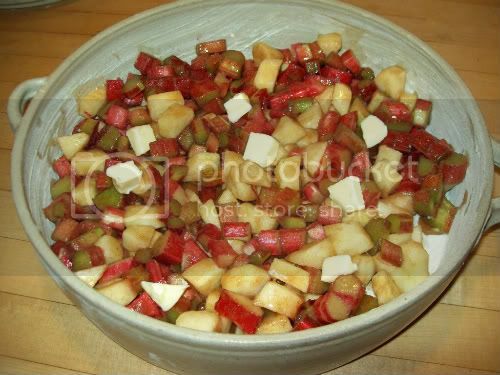 With hands, sprinkle over the top of the rhubarb and apple mixture. 6.) 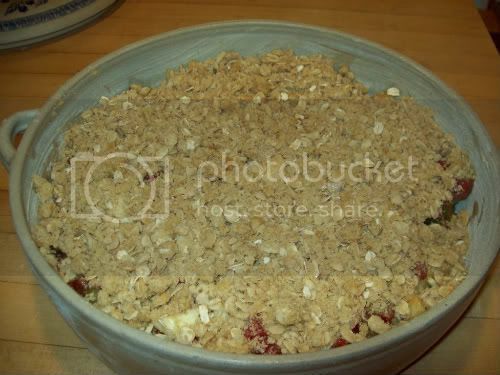 Bake for about 45 to 55 minutes, or until browned and fruit is bubbly. Serves 8. This dessert recipe is a great way to use your rhubarb, and it makes a wonderful treat for the family. 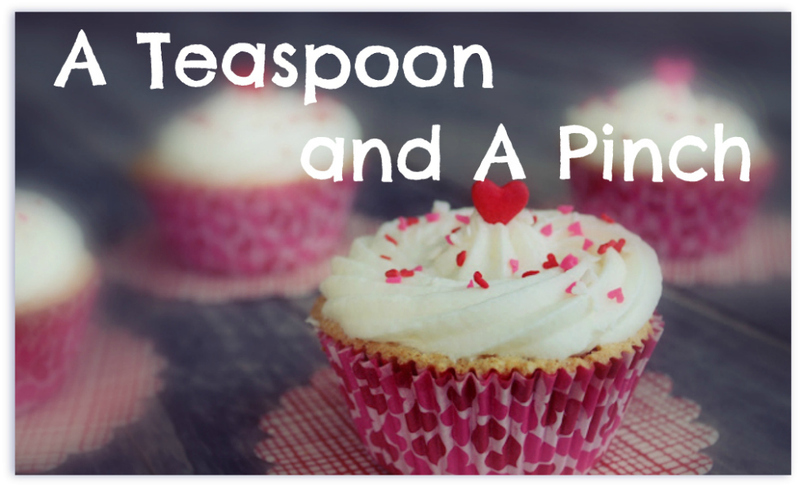 Serve this cold or warm, plain or with a little cream or a scoop of ice cream. I can't read your Hunt's can - what is it? My son is allergic to onions (which as far as I know, all pasta sauces contain). Maybe I could just use a tomato paste with a few herbs that he likes? Would that taste weird? Thanks! I used Hunt's traditional and it did list onions as an ingredient. I would go with 2 cans of tomato sauce instead of paste and add basil and garlic to it.